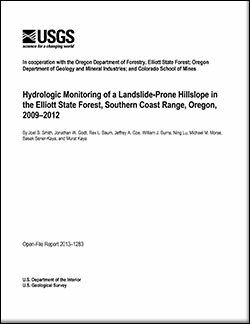 The Oregon Coast Range is dissected by numerous unchanneled headwater basins, which can generate shallow landslides and debris flows during heavy or prolonged rainfall. An automated monitoring system was installed in an unchanneled headwater basin to measure rainfall, volumetric water content, groundwater temperature, and pore pressures at 15-minute intervals. The purpose of this report is to describe and present the methods used for the monitoring as well as the preliminary data collected during the period from 2009 to 2012. Observations show a pronounced seasonal variation in volumetric water content and pore pressures. Increases in pore pressures and volumetric water content from dry-season values begin with the onset of the rainy season in the fall (typically early to mid October). High water contents and pore pressures tend to persist throughout the rainy season, which typically ends in May. Heavy or prolonged rainfall during the wet season that falls on already moist soils often generates positive pore pressures that are observed in the deeper instruments. These data provide a record of the basin’s hydrologic response to rainfall and provide a foundation for understanding the conditions that lead to landslide and debris-flow occurrence. Contains: all related content to this data set.